Citrulline is the resultant product of the condensation reaction that occurs during normal function of the ornithine transcarbamylase reaction. Under normal circumstances, citrulline is condensed with aspartic acid to form argininosuccinic acid (ASA), which is a reaction mediated by the argininosuccinic acid synthase enzyme. Participation of aspartate in the reaction fixes a second waste nitrogen atom into the reaction product, ASA; the first waste nitrogen molecule derives from free ammonia in the carbamyl phosphate synthetase (CPS) reaction. ASA synthase deficiency leads to accumulation of citrulline, a condition known as citrullinemia. The hepatic urea cycle is the major route for waste nitrogen disposal, which is chiefly generated from protein and amino acid metabolism. Low-level synthesis of certain cycle intermediates in extrahepatic tissues also makes a small contribution to waste nitrogen disposal. A portion of the cycle is mitochondrial in nature; mitochondrial dysfunction may impair urea production and result in hyperammonemia (see Hyperammonemia). Overall, activity of the cycle is regulated by the rate of synthesis of N -acetylglutamate, the enzyme activator that initiates incorporation of ammonia into the cycle. See the image below. Urea cycle. Compounds that comprise the urea cycle are numbered sequentially, beginning with carbamyl phosphate. At the first step (1), the first waste nitrogen is incorporated into the cycle; also at this step, N-acetylglutamate exerts its regulatory control on the mediating enzyme, carbamyl phosphate synthetase (CPS). Compound 2 is citrulline, the product of condensation between carbamyl phosphate (1) and ornithine (8); the mediating enzyme is ornithine transcarbamylase. Compound 3 is aspartic acid, which is combined with citrulline to form argininosuccinic acid (4); the reaction is mediated by argininosuccinate (ASA) synthetase. Compound 5 is fumaric acid generated in the reaction that converts ASA to arginine (6), which is mediated by ASA lyase. Citrulline can be metabolized outside the liver, and ASA synthase is normally expressed in the brain, kidney, and skin fibroblasts. In citrullinemia, the genetic defect is expressed in all of these tissues. The body is unable to circumvent the defect by conversion of citrulline to arginine, as it can under normal circumstances. As mentioned above, a second waste nitrogen molecule is normally incorporated into the urea cycle by a reaction of citrulline to aspartic acid; however, this reaction is secondarily impaired and results in a 50% reduction of the overall capacity of the urea cycle to dispose of ammonia. Accordingly, affected individuals have a propensity for developing hyperammonemia. In vitro evidence in rat brains suggests that accumulated citrulline and ammonia impair the organ's antioxidant capacity. L-citrulline added to the cerebral cortex reduced the 30-day-old rat brains’ total radical-trapping antioxidant potential, the total antioxidant reactivity, and specific activities of catalase, superoxide dismutase, and glutathione peroxidase. Therefore, oxidative stress may contribute to the neuropathologic events observed in citrullinemia. Citrullinemia cases have been reported in Japan that show a particular form of citrullinemia in adults that had been previously undiscovered and untreated; one case was discovered as late as age 48 years. Some patients were developmentally delayed from childhood, whereas others were asymptomatic until onset. Thus, age of onset is as unpredictable in citrullinemia as in ornithine transcarbamylase (OTC) deficiency. Mass screening for the citrin mutation that causes both NICCD and adult-onset citrullinemia has occurred in East Asia. Morbidity and mortality rates associated with citrullinemia are high. Citrullinemia is inherited as an autosomal recessive trait; thus, both genders are equally affected. As with other urea cycle defects, the age of presentation can widely vary among individuals with citrullinemia, although the most common presentation is in the neonatal period. Older children who were not treated in the neonatal period and were diagnosed later as part of an evaluation for the etiology of their mental retardation have been reported. Prestes CC, Sgaravatti AM, Pederzolli CD, et al. Citrulline and ammonia accumulating in citrullinemia reduces antioxidant capacity of rat brain in vitro. Metab Brain Dis. 2006 Mar. 21(1):63-74. [Medline]. Saheki T, Kobayashi K. Mitochondrial aspartate glutamate carrier (citrin) deficiency as the cause of adult-onset type II citrullinemia (CTLN2) and idiopathic neonatal hepatitis (NICCD). J Hum Genet. 2002. 47(7):333-41. [Medline]. Summar ML, Koelker S, Freedenberg D, et al. The incidence of urea cycle disorders. Mol Genet Biol. September-October 2013. 110:179-180. [Medline]. Noto D, Takahashi K, Hamaguchi T, et al. A case of adult onset type II citrullinemia with portal-systemic shunt. J Neurol Sci. 2009 Mar 12. [Medline]. Yazaki M, Ikeda S, Kobayashi K, Saheki T. Therapeutic approaches for patients with adult-onset type II citrullinemia (CTLN2): effectiveness of treatment with low-carbohydrate diet and sodium pyruvate. Rinsho Shinkeigaku. 2010 Nov. 50(11):844-7. [Medline]. Nakamura M, Yazaki M, Kobayashi Y, Fukushima K, Ikeda S, Kobayashi K, et al. The characteristics of food intake in patients with type II citrullinemia. J Nutr Sci Vitaminol (Tokyo). 2011. 57(3):239-45. [Medline]. Engel K, Hohne W, Haberle J. Mutations and polymorphisms in the human argininosuccinate synthetase (ASS1) gene. Hum Mutat. 2009 Mar. 30(3):300-7. [Medline]. Marquis-Nicholson R, Glamuzina E, Prosser D, Wilson C, Love DR. Citrullinemia type I: molecular screening of the ASS1 gene by exonic sequencing and targeted mutation analysis. Genet Mol Res. 2010 Aug 3. 9(3):1483-9. [Medline]. Diez-Fernandez C, Rüfenacht V, Häberle J. Mutations in the Human Argininosuccinate Synthetase (ASS1) Gene, Impact on Patients, Common Changes, and Structural Considerations. Hum Mutat. 2017 May. 38 (5):471-484. [Medline]. Nagasaka H, Okano Y, Tsukahara H, et al. Sustaining hypercitrullinemia, hypercholesterolemia and augmented oxidative stress in Japanese children with aspartate/glutamate carrier isoform 2-citrin-deficiency even during the silent period. Mol Genet Metab. 2009 Jan 25. [Medline]. Gunz AC, Choong K, Potter M, Miller E. Magnetic resonance imaging findings and neurodevelopmental outcomes in neonates with urea-cycle defects. Int Med Case Rep J. 2013 Aug 19. 6:41-8. [Medline]. [Full Text]. Bireley WR, Van Hove JL, Gallagher RC, Fenton LZ. Urea cycle disorders: brain MRI and neurological outcome. Pediatr Radiol. 2012 Apr. 42(4):455-62. [Medline]. Tarasenko N, Gomez-Rodriguez J, McGuire PJ. Impaired T cell function in argininosuccinate synthetase deficiency. J Leukoc Biol. February 2015. 97:273-278. [Medline]. Kimura N, Kubo N, Narumi S, et al. Liver Transplantation Versus Conservative Treatment for Adult-Onset Type II Citrullinemia: Our Experience and a Review of the Literature. Transplant Proc. 2013 Nov. 45(9):3432-7. [Medline]. Berry GT, Steiner RD. Long-term management of patients with urea cycle disorders. J Pediatr. Jan 2001. 138(1 Pt 2):S56-S62. [Medline]. Hayakawa M, Kato Y, Takahashi R, Tauchi N. Case of citrullinemia diagnosed by DNA analysis: including prenatal genetic diagnosis from amniocytes of next pregnancy. Pediatr Int. 2003 Apr. 45(2):196-8. [Medline]. Issa AR, Yadav G, Teebi AS. Intrafamilial phenotypic variability in citrullinaemia: report of a family. J Inherit Metab Dis. 1988. 11(3):306-7. [Medline]. Kennaway NG, Harwood PJ, Ramberg DA, Koler RD, Buist NR. Citrullinemia: enzymatic evidence for genetic heterogeneity. Pediatr Res. 1975 Jun. 9(6):554-8. [Medline]. Kuhara H, Wakabayashi T, Kishimoto H, et al. Neonatal type of argininosuccinate synthetase deficiency. Report of two cases with autopsy findings. Acta Pathol Jpn. 1985 Jul. 35(4):995-1006. [Medline]. Matsuda I, Anakura M, Arashima S, Saito Y, Oka Y. A variant form of citrullinemia. J Pediatr. 1976 May. 88(5):824-6. [Medline]. Morrow G 3rd, Barness LA, Efron ML. Citrullinemia with defective urea production. Pediatrics. 1967 Oct. 40(4):565-74. [Medline]. Ohura T, Kobayashi K, Tazawa Y, et al. Clinical pictures of 75 patients with neonatal intrahepatic cholestasis caused by citrin deficiency (NICCD). J Inherit Metab Dis. 2007 Apr. 30(2):139-44. [Medline]. Saheki T, Kobayashi K, Iijima M, et al. Metabolic derangements in deficiency of citrin, a liver-type mitochondrial aspartate-glutamate carrier. Hepatol Res. 2005 Oct. 33(2):181-4. [Medline]. Steiner RD, Cederbaum SD. 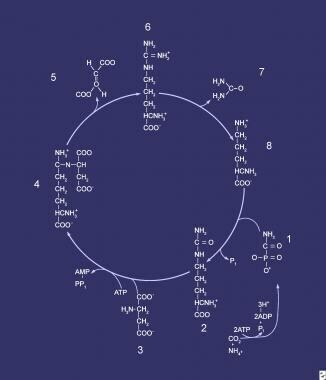 Laboratory evaluation of urea cycle disorders. J Pediatr. 2001 Jan. 138(1 Suppl):S21-9. [Medline]. Tamamori A, Fujimoto A, Okano Y, et al. Effects of citrin deficiency in the perinatal period: feasibility of newborn mass screening for citrin deficiency. Pediatr Res. 2004 Oct. 56(4):608-14. [Medline]. Tazawa Y, Kobayashi K, Abukawa D, et al. Clinical heterogeneity of neonatal intrahepatic cholestasis caused by citrin deficiency: case reports from 16 patients. Mol Genet Metab. 2004 Nov. 83(3):213-9. [Medline]. Walter JH, Allen JT, Holton JB. Arginosuccinate synthetase deficiency: good outcome despite severe neonatal hyperammonemia. J Inherit Metab Dis. 1992. 15(2):282-3. [Medline].